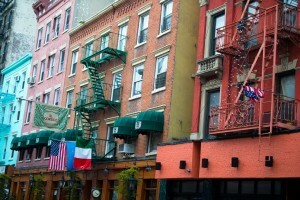 The East Village is teeming with cozy, often packed restaurants and bars established on the ground floor of pre-war walk ups, creating a grungy vibrancy. At night, this neighborhood hums with the energy of night owls who come from near and far to play in its many local haunts until dawn. There are culinary delights for every palate and it’s all so good! Japanese and Thai restaurants cluster around 8th and 9th Streets, while Indian restaurants line 6th St. between 1st and 2nd Avenues. Every cuisine from Ukrainian to Venezuelan to Moroccan is represented throughout the neighborhood. Bars like Miss Lily’s, Pinks, and Niagara are crowed with people dancing to live music or DJs. Every genre of music from jazz at Mona’s to Hawaiian at Otto’s Shrunken Head can be found. Sprinkled throughout the neighborhood are quirky, locally owned shops peddling old records, vintage eyewear, yarn, or whimsical jewelry. Bohemian culture is alive and well in the clothing and head shops along Astor Place. 2nd Avenue is littered with vintage clothing stores. Tompkins Square Park hosts a greenmarket, a Halloween Dog parade, a drag festival, and The Charlie Parker Jazz Festival. Young newcomers to the city, artists, liberals, and people who have lived there forever all share this exciting neighborhood. They live mostly in the pre-war walk-ups that make up the architecture of the neighborhood. Prices here are around average for NYC. In the far eastern section of the neighborhood, also called Alphabet City, prices are somewhat lower than the NYC average.